There are some stories out there in the news that are just absolutely begging for puns. To wit: A raisin farmer in California is battling the government in a case of sour grapes, raisin’ a stink over the feds’ demands that he pay at least $650,000 in unpaid fines and hand over 1.2 million pounds of unpaid raisins into the national reserve. We heard it through the grapevine. The 68-year-old man has refused to fork over a portion of his raisin harvest into a reserve set up after World War II, and as such, has racked up more than half a million in fines. 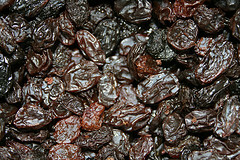 The farm program was created to keep demand for raisins high at a time when it was declining. In order to prevent supply from outstripping demand, farmers would dump a bunch of their raisins in the national reserve each harvest. That way, consumers would still pay higher prices for raisins and farmers wouldn’t go out of business. But the raisins going into the reserve? Basically, the government got them for free. Starting in 2002, he refused to hand over a percentage of his raisins, going against Marketing Order 989. The government isn’t sitting atop giant piles of raisins, but it does store those crops in warehouses around California. The reserve is run by the Raisin Administrative Committee, which is allowed to sell off some of those reserve raisins… the ones it paid nothing for. Some might be sold to foreigners, or used to feed schoolchildren — whatever gets them off the open market and keeps the supply for commercial buyers low. That means you could be paying higher prices for raisins than you would if the farmers were allowed to sell all their crops off. Any money left over afterwards goes back to farmers, but the Washington Post notes that that isn’t often the case. The farmer was staked out by a private detective agency when he stopped handing over his raisins, resulting in a list of charges saying he’d broken the law. He’s now taken the case all the way up the court system stepladder, losing every time — until he hit the big time with the U.S. Supreme Court. The justices also seem a bit puzzled by this whole raisin reserve system. “What it does is it takes raisins that we grow — in effect, throws them in the river,” Justice Stephen G. Breyer said. “I can’t believe that Congress wanted the taxpayers to pay for a program that’s going to mean they have to pay higher prices” for raisins, he added. The court ruled this spring that the 9th Circuit in California must settle the case. If he loses, he’ll owe the government about $3 million, he guesses. “If we lose, we’re bankrupt. We won’t have a pot to piss in,” the farmer said. For now, at least, he won’t have to fork over any more raisins into the reserve, and neither will other farmers: The Agriculture Department and the Raisin Administrative Committee have agreed that no new raisins should be put into the reserve over the past three years.